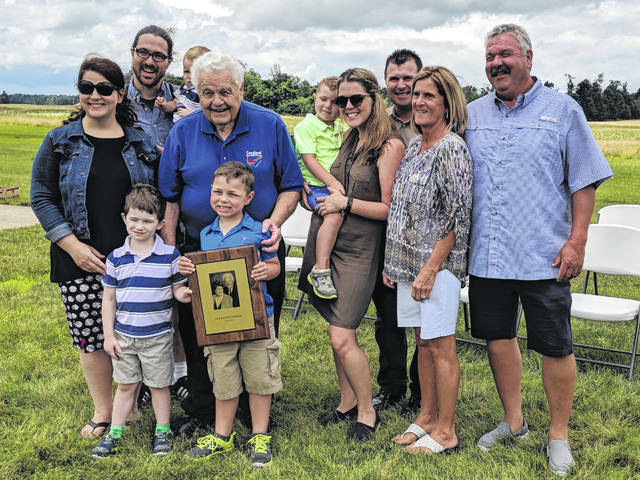 Jack Fishburn with several of his family members and the ODNR Hall of Fame award presented to him June 23. Jack Fishburn receives an Ohio EPA grant award for a more efficient lead recovery system at Cardinal Shooting Center. From left to right are ODNR director Jim Zehringer, Fishburn and Ohio EPA director Craig Butler. Both Jack Fishburn and his late wife Karen are pictured on the ODNR Hall of Fame award presented by ODNR director Jim Zehringer. Cardinal Center Founder Jack Fishburn received the Ohio Department of Natural Resources Hall of Fame award from ODNR Director Jim Zehringer at a special induction ceremony at Cardinal Center on June 23. 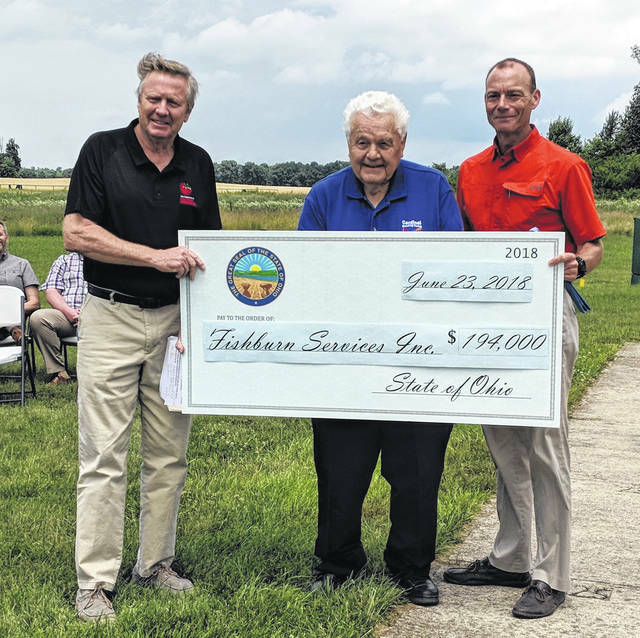 Fishburn was also presented an Ohio EPA grant for $194,000 at the ceremony. He was every bit as enthusiastic about this grant given to Cardinal Center as he was about the personal award. The grant will go toward purchasing a more efficient lead shot recovery system for the Cardinal Shooting Center. When Ohio EPA Director, Craig Butler presented the grant award, he noted that the new lead recovery system will increase the lead shot collection from the present rate of 40 percent to 90 percent recovery or more. The Cardinal Shooting Range will be able to reduce potential environmental contamination and improve the lead shot collection process through the new and more efficient “Shot Block System.” Butler emphasized that this new system is “not cheap.” The Cardinal Center has committed to matching the EPA grant with $534,269. The Shot Block System captures lead shot right after it’s been fired from the shotgun. It acts as a catch net for flying lead shot and then concentrates it at the base of the system. At this point the shot can be collected either using a vacuum or gravity collection system. With a 50 percent increase in lead shot collection they estimate 135 tons of lead shot collected annually. This type of recovery system is used in other parts of the USA, but it’s the first of its kind in Ohio. Butler said that Cardinal Center intends to help other ranges in the region who are looking to reduce their impact on the environment and improve the lead shot collection process. They will be able to recover this investment in reselling the recovered lead. In the presentation of the ODNA Hall of Fame award, Zehringer listed a few of the former prestigious Hall of Fame recipients including: Bob Evans, Louis Bromfield, Governor Jim Rhodes, Bob and Hope Taft, and John Chapman better known as Johnny Appleseed. He noted that the award is Ohio’s top honor for individuals who have made significant contributions to preserving and protecting the state’s natural resources. 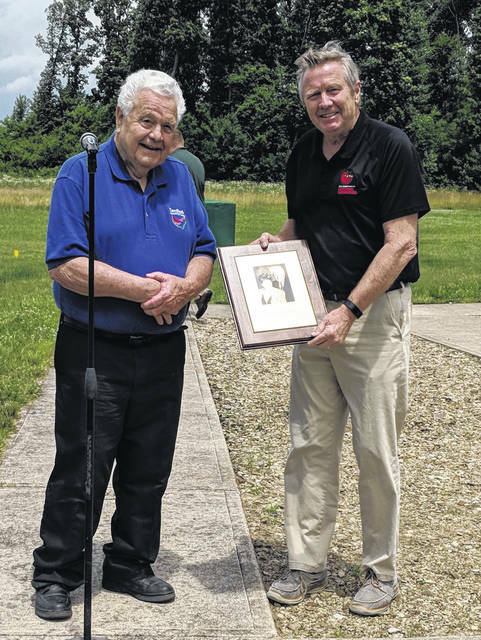 Zehringer added that Cardinal Center annually hosts three of the five largest trap shoots in the country as well as the largest youth shooting event in the country. Other accomplishments he shared about Fishburn is that he is the co-developer of two local sanitary sewer plants that serve both I-71 interchanges in Morrow County, member of the Ohio State Trapshooting Hall of Fame, Chairman of the Morrow County Board of Developmental Disabilities and the Ohio Republican Finance Committee. He was the developer and chairman of Morco Water Company, now Delco. Zehringer described Jack and his late wife Karen as “a dynamic team that built the Cardinal Shooting Center.” He said Jack and Karen worked with their family to turn the small shooting range into one of the largest privately –owned ranges in the world, with the ability to host national shooting championships. “What he has done for the shooting sports community and by putting Ohio on the map with this great facility, is remarkable,” Zehringer said. Fishburn responded with emotion, “This is a very high honor and I don’t know how to thank you. I only wish she could be here,” said Jack, pointing to the photo of his wife Karen on the award plaque.